I feel like I have found the perfect store for goth jewelry and accessories. Like I've said before and I'll say it again, it isn't like I need anymore accessories. I don't need anything as extravagant as these, but my temptation is getting the better of me! Aeternum Nocturne has lots of gorgeous and lifeless black options. Not only that, there are also many somber colors to choose from. Take a look at the diverse selection and let me know what you think! 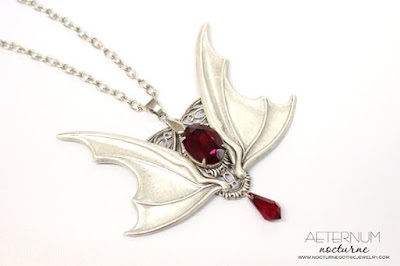 What I like most about this vampire gothic necklace is that both men and women can wear it. The jewels look like solidified blood kept to survive all time. 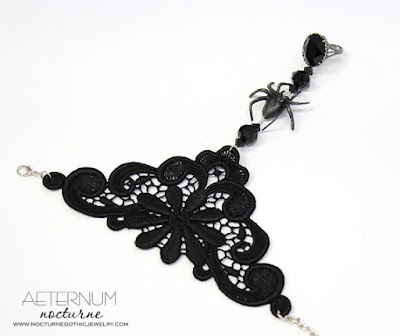 This Halloween black spider gothic bracelet is amazing. You would look so enigmatic wearing this lacy beauty with a veil and black dress. 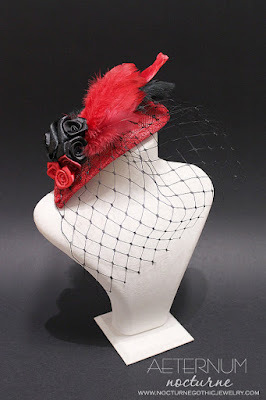 I think the spider bracelet and red and black fascinator would go well together. I love the bright red hues used. 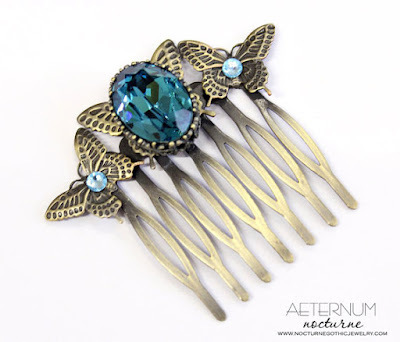 Don't you think that this gothic Victorian haircomb is enchanting? 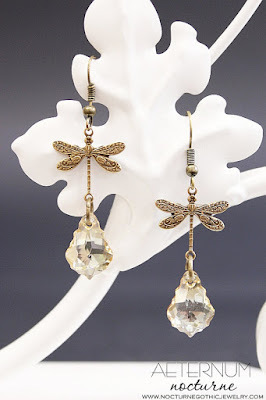 The soft and alluring gems are a great compliment to the butterflies. I imagine royalty passing this cream rose ring down generation to generation. It's so delicate and haunting. It looks like it was made from bones. This is a classic vampire weapon and tool. 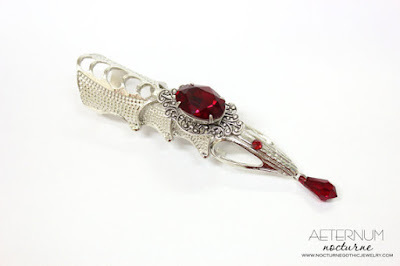 This vampire gothic ring is ornate and may not the best weapon as there is a jewel at the very tip. The deep dark purple hues of the roses are calling to me. 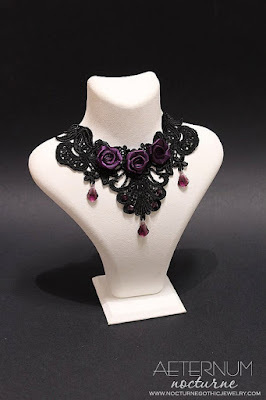 This purple roses lace gothic choker might be too gaudy for me. I wish we lived in Victorian times so I could get away with showing it off. These Victorian fantasy gothic earrings are ghostly and remarkable. I need more baroque styled pendants in my life. Green isn't typically a color I enjoy, but in this case I do. 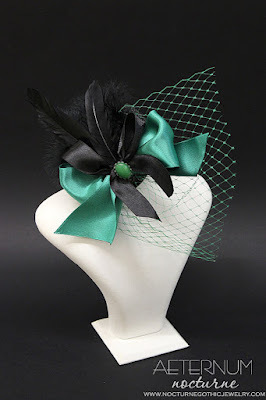 This emerald gothic fascinator is simple in design and could be worn every day. The jade jewel embedded in the black bow reminds me of a beetle. 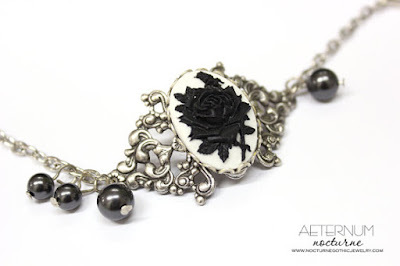 There is something more disturbing about this black rose gothic bracelet compared to the white rose. Perhaps it's because black roses remind me of death and sorrow. They're something I imagine growing in a cemetery. 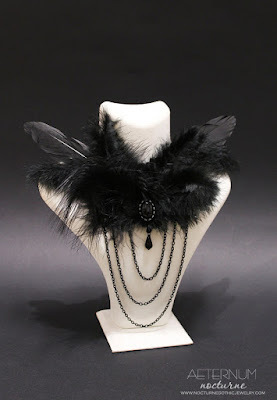 I would wear this black swan princess gothic lace choker out to a party or a masquerade. I would need to keep this out of the way of my cats! 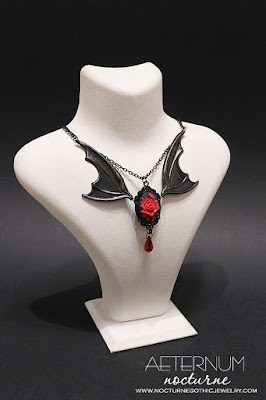 If a vampire queen had to have one piece of jewelry, it would have to be this vampire gothic necklace. Those bat wings are absolutely amazing! 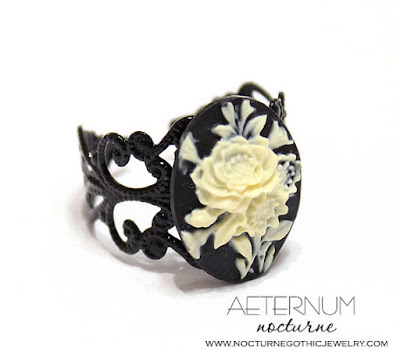 Seriously, you must look at this store Aeternum Nocturne on Etsy. There are many jewelry options and accessories that come in a whole array of colors and styles. Check it out and comment below!